Out of the blue last week I decided to check out the Dell.com website. This will be mostly about the ergonomics of living with, and using, the non-touchscreen laptop as a writing tool. If you’re looking for a basic, inexpensive laptop for text based productivity I can recommend this model. * Price. “You said that.” Yeah, it’s worth mentioning twice. I started checking out the specs, though I knew deep down I would already be buying it lol. But the car needs tires! 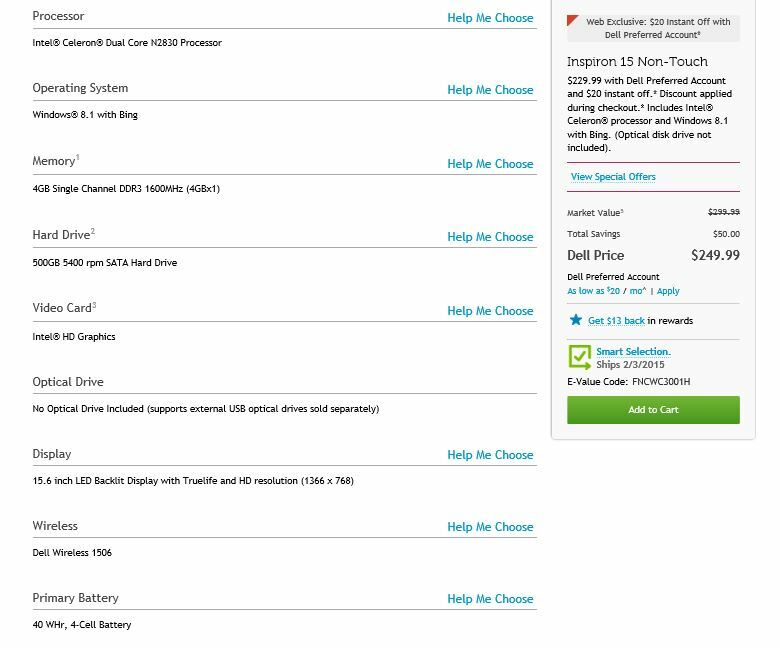 The specs were rather generic … but that price! Still it was fine for what originally sent me on the search saga … a dedicated writing tool. 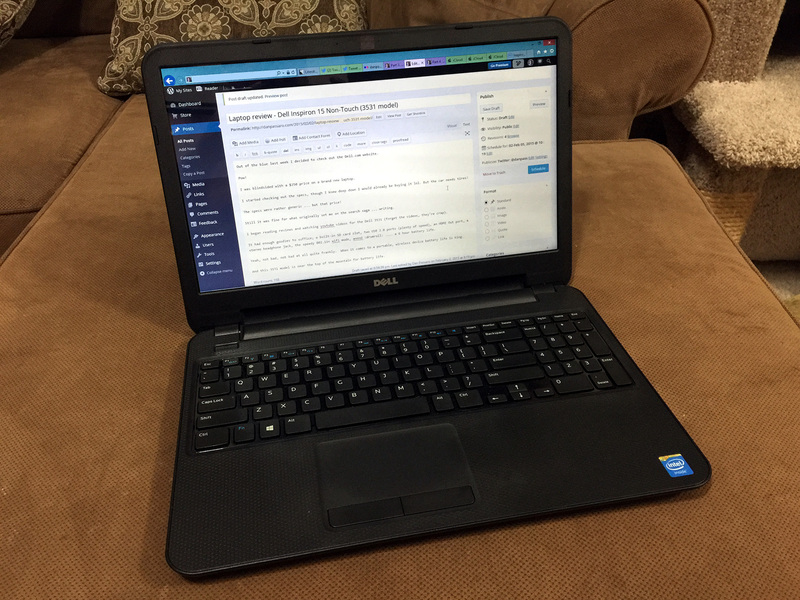 I began reading reviews and watching youtube videos for the Dell 3531 (forget the videos, they’re crap). It had enough goodies to suffice; the speedy 802.11n wifi, a built-in SD card slot, two USB 2.0 ports (plenty of speed), an HDMI Out port, a stereo headphone jack, no fan so it’s very quiet annnnnnnd :drumroll: …. a 6 hour battery life. Yeah, not bad, not bad at all quite frankly. When it comes to a portable, wireless device battery life is king. And this 3531 model is near the top of the mountain for battery life. Alas there were no options available. This is the Model-T of laptops. No SSD hard drive option, which was my specific desired option. No media of any sort comes with the laptop. There is the Dell program for creating a backup and recovery disk but physical media from the factory was better. Turns out you can request it from Dell. I got on the Chat thing on their site, gave the tech my service tag number and presto, arrived yesterday. It’s even shipped on a USB stick. That simplifies things since the laptop doesn’t have an optical drive either (no big loss there). Dell tells me that the key/serial number is built into the motherboard. The SSD hard drive gets rid of the last moving piece. The drive that comes with the laptop is your typical 500gb 5400rpm spinning hard drive. So with the SSD you gain a bunch of data transfer speed and lose the moving parts. Very tempting. The catch? 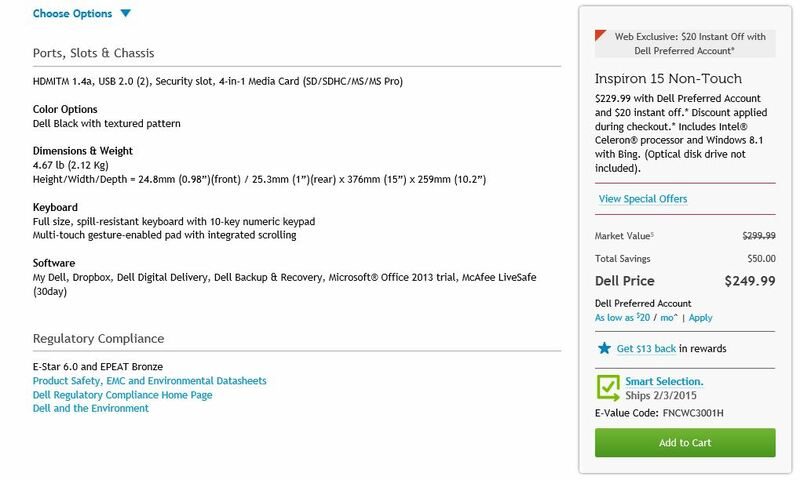 An SSD of equal capacity is nearly the same price as the entire laptop. I suppose a 250gb SSD would be ok.
Another change one can make is to switch the single 4gb RAM module for one 8gb RAM module. So far the 4gb is adequate. Moving on … the system is running my key programs, such as Photoshop 7 and Solidworks 2007 engineering CAD, just fine so far. Those two are, of course, legacy programs of sorts but they work well for my purposes. The ultimate writer’s tool, Scrivener, runs fine as well. Oddly enough, the modern versions of WEB programs struggle a bit. Probably due to the Java. The browser based iCloud Pages, Facebook, Twitter, etc … I suppose these are heavy on the Java/Flash type algorithms. They stutter at times. Maybe the 8gb RAM module would help in that respect. Physically the laptop runs rather wide, a full 15″. You’ll need the laptop bag for 15.6in models (or larger). Like most 15.6in screen laptops out there in computer land this one has a full number pad on the right. It’s a rather roomy keyboard, basically a 2/3 version of a desktop keyboard/numpad. A consequence of this positioning is that your hands are offset to the left a bit. They position the touchpad slightly left to accommodate that positioning. I’m still getting used to it. All the laptops I’ve used in the past were just the keyboard, no number pad. The keyboard itself is not backlit. That would have been nice. The keys have a nice, tactile press to them. You don’t feel compelled to hammer on the keys to get the keystroke to register on screen. The keys are rather quiet. You could type away in a quiet room without overly disturbing anyone. Overall I give the keyboard a 8.5/10. If you’re a spreadsheet and data entry person you’d likely give it an 11/10. The touchpad has two separate buttons at it’s base and the click rather loudly ‘KA-CHAK’. The surface is slightly rough, not the smooth-rough of an Apple touchpad. There is a Dell program built-in that allows for multiple gesture options which is very nice. The gestures don’t respond as smoothly as on an Apple laptop, possibly due to the speed of the system vs any actual issue with the touchpad or control program. I give the touchpad a 7.5/10. The fanless design means you have a silent laptop. You can feel the ‘hum’ of the spinning hard drive, and if you put your ear on the laptop you can hear the drive but otherwise that’s it for sensory inputs from the laptop. The screen is nothing to write home about, again ‘adequate’, but not something that would impress a photographer/videographer. Though, due to the width of the computer, the screen is 16:9. Movies work perfectly on the laptop. I installed iTunes and downloaded some of my HD movies and they looked just fine at full brightness. It wasn’t real HD as the screen maxes at 1366×768 but it did look good. The screen/lid is really thin, as is the computer base. When you close it up the laptop is nice and slim, just one inch thick. It’s rather nice really. It’s a pretty neat Model-T. Previous Previous post: AMSAT Fox-1A satellite is ready for launch!